Whether inshore, nearshore or offshore, there are fish to be caught and beautiful weather to enjoy. The inshore bite for spotted seatrout is proving to be quite good when using artificials such as soft plastics combined with a jig head. While targeting trout, you will encounter ladyfish and possibly a few pompano. Fishing structure — both inshore and offshore — is yielding a variety of species with the most prominent being sheepshead. 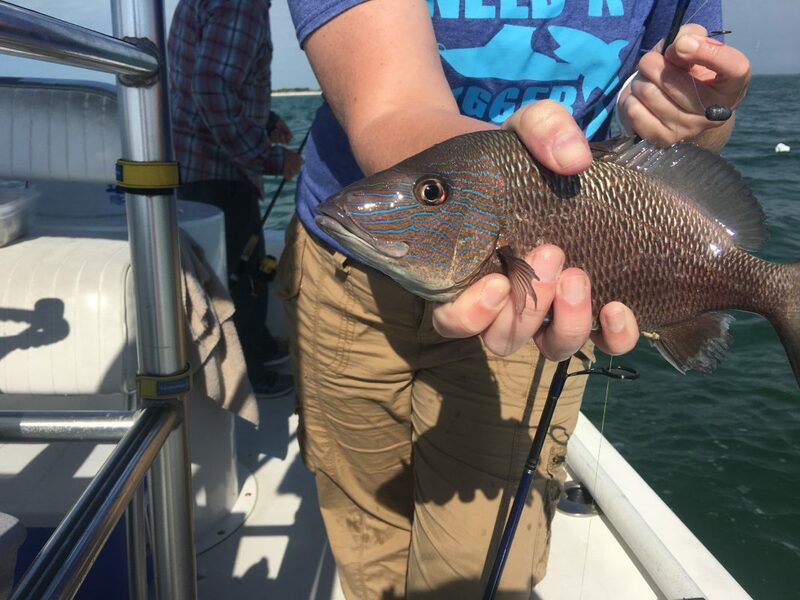 Live shrimp is working well for these convict-striped fish as well as mangrove snapper, porgies, Key West grunts and hogfish. Fishing along the beaches is proving to be good when using live shrimp, especially for whiting and black drum. Moving offshore, fishing wrecks, reefs and ledges is producing a variety of fish including amberjack, bonito, hogfish, snappers and goliath grouper. So, no matter what type of fisher you are, Anna Maria Island is host to some great fishing experiences in January. On my own Southernaire charters, I’m fishing inshore and nearshore for a variety of species. Sheepshead by far are the most abundant. I’m finding them around structure in Tampa Bay and along the beaches. Casting live shrimp on a knocker rig is luring these nibblers to the hook. Most are 14 inches, although fish up to 18 inches are not uncommon. Fishing around wrecks and reefs is yielding mangrove snapper and Key West grunts. Again, live shrimp on a knocker rig is working well as my clients are reeling up snapper — in the 18-inch range — and an abundance of grunts. Black drum and catch-and-release redfish are being caught along beaches and grass areas. Most of the black drum are in the slot of 14-24 inches. As for the catch-and-release redfish, most are 20-26 inches. So, if the weather holds, don’t miss the opportunity to get out and do some January fishing around Anna Maria Island. You might find it to be quite good.